In 1974, Ken Wise discovered an article left on his desk by an anonymous colleague. Written years earlier by Stanford’s Dean of Engineering Frederick Terman, it predicted the inevitable decline of the Midwest’s electronics industry. Today, 36 years later, Wise is recognized as one of the world’s foremost experts in sensor technology as well as a MEMS (microelectromechanical systems) pioneer and entrepreneur. And he still keeps a copy of the article that motivated him to create a MEMS industry in Michigan. In 1995, along with colleagues Nader Najafi and Khalil Najafi, Wise launched the first MEMS instrumentation company in Michigan, Integrated Sensing Systems (ISSYS). Three years later, he and Khalil Najafi submitted a proposal to establish an Engineering Research Center on campus. 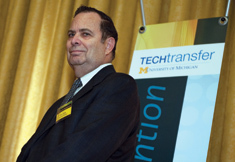 In September of 2000, the University of Michigan—in collaboration with Michigan State University and Michigan Technological University—received a ten-year, non-renewable grant from the National Science Foundation to create the Engineering Research Center for Wireless Integrated MicroSystems (WIMS ERC). At the time, the two had no way of knowing that the Center would launch a global revolution in sensor technology. Or that the spin-off discoveries, start-ups and educational programs would impact health care, infrastructure, the environment, national security—and the regional economy—for decades to come. The original goal was relatively modest. "The U-M was an international leader in MEMS," Wise says. "We believed that having an ERC on campus would allow faculty to accomplish much more than they otherwise could with scattered grants and contracts. Above all, we wanted to move the field to a higher level by leveraging interdisciplinary team research." In the years since then, the Center has been the catalyst for a series of landmark discoveries. The crowning achievement of its interdisciplinary research teams, according to Wise, has been the linking of sensor technology with wireless interfaces and embedded computing. "As a result," he explains, "microsensors now have the capacity to connect with the non-electronic world." And that, in turn, has opened the way to a true revolution..
Education has been another priority of the Center. Of the 4,000 pre-college students who have enrolled in ERC summer courses, nearly 60 percent of the high-school graduates have gone on to pursue college studies in science and engineering. The WIMS ERC has also graduated more than 150 Ph.D. students, many of whom have pursued entrepreneurial paths. "The fact that a majority of our doctoral students want to commercialize their theses projects demonstrates a profound cultural shift over the last 10 years," Wise says. "This innovative spirit is a flywheel that, once in motion, continues to regenerate." In fact, so strong is the entrepreneurial culture within the WIMS ERC that the Center has spawned 11 start-ups and at least 6 related MEMS/microsystem-based companies. Beginning in September of 2010, as a "graduated" NSF Engineering Research Center, the WIMS ERC began moving to operation as a campus-wide institute. "Engineering is the best tool we have for solving the major problems of this century," he says emphatically. "And I know that the WIMS ERC will continue to make significant contributions. We have a firm vision, reachable goals, wonderful people and, thanks to the last 10 years, a strong foundation for technological leadership." As for Wise, he plans to retire in May 2011. But those who know him best believe his best contributions are still ahead. WIMS ERC in 2000. Wise, who will retire from the College of Engineering in May of 2011, is considered one of the world's preeminent researchers in microsensor technology.